The Mickey Mouse Clubhouse is here to join the party! With this Mickey Mouse Bouncy Castle with a built-in slide, imagination is the limit for fun activities you can do with it. It can provide kids hours of fun and enjoyment with low risk of injury. While you can just leave the kids to just bounce and play on their own, you might want to plan a few games to keep them busy and make the bouncing and leaping around a lot more fun. We suggest you do the “Bounce and Freeze” game. Play songs as the kids bounce up and down on the bouncy castle. But as soon as the music stops, they should “freeze.” Whoever fails to do so is out of the game. Prepare a prize for the winner to make it more exciting. 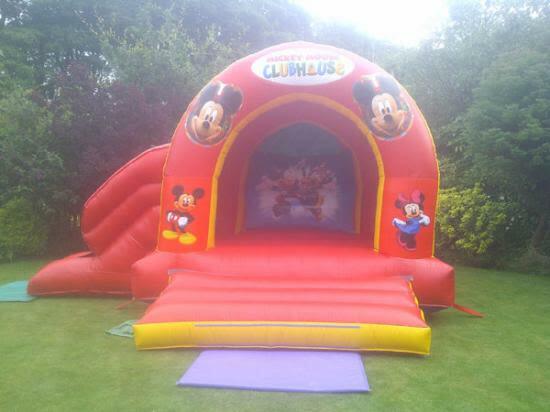 The Mickey Mouse bouncy castle is available for hire for only £55, which already includes door-to-door delivery, setup, installation, and collection. You can also hire it overnight for an additional fee of £15. Be sure to have enough space for this bouncy castle, which requires a dimension of 20ft x 18ft x 14ft. Additionally, this castle is only suitable for children up to 14 years old. It comes with a rain cover, so you need not worry about a little shower. To place an order or for further questions, call us at 07760 753308 or email us at info@kcbouncycastlehire.co.uk. You can also fill in the contact form we have on site.